Proving once again that Mars is a complex and fascinating place, NASA's Opportunity rover has entered new terrain and is providing scientists with more discoveries and puzzles to solve. "One of the things we've been wondering," said principal investigator Steve Squyres, "is whether the rounded concretions we call 'blueberries' are the same everywhere. It turns out they're not. The berries are more numerous here, and some seem to be smaller than any we've ever seen." 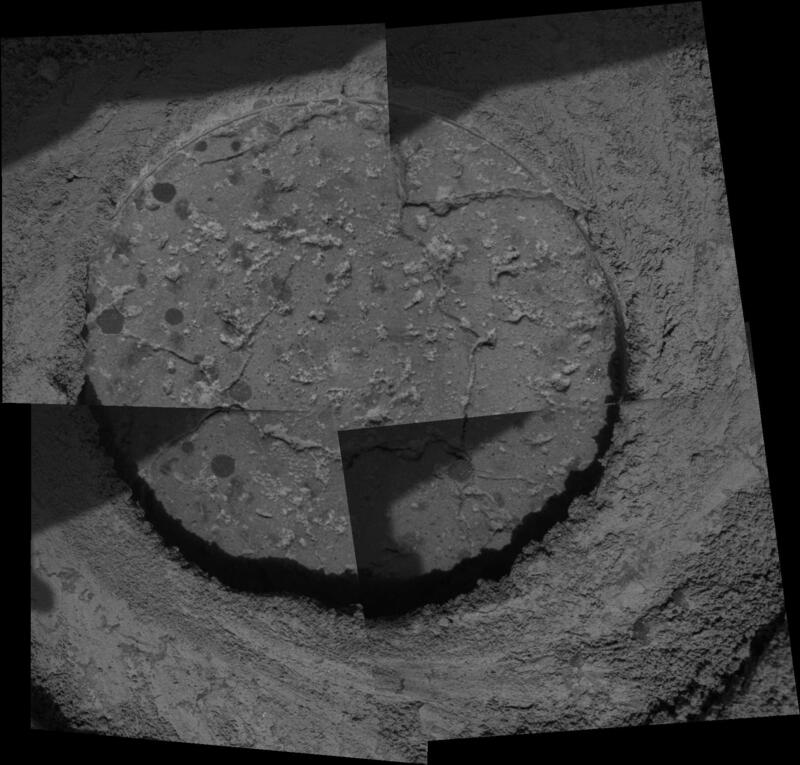 This microscopic image of a drill hole cut into a martian rock nicknamed "Ice Cream" by the rover's rock abrasion tool shows cross sections of round concretions 1 to 2 millimeters (0.04 to 0.08 inches) wide. Science team members are debating whether the grayish-looking smudges that are not as round are concretions or some other feature. Opportunity is now almost 4 kilometers (2.5 miles) south of "Endurance Crater," where the rover spent from May through December of 2004 reading the story of a watery past recorded in the martian rocks. After exiting "Endurance" on martian day, or sol, 316 (Dec. 13, 2004), Opportunity turned south and continued the trek across land where no human has trod, demonstrating that endurance is more than just a name. Opportunity took this mosaic of images with its microscopic imager on sol 546 (Aug. 6, 2005). The area shown is approximately 6 centimeters (2.4 inches) wide. The shaded portions on the left side of each quadrangle in the mosaic are silhouettes of the rover's robotic arm.